Mumbai, March 18: Bengaluru FC won their first Indian Super League title on Sunday as they defeated FC Goa 1-0. Post-victory their captain Sunil Chhetri dubbed the win as extremely special for him. 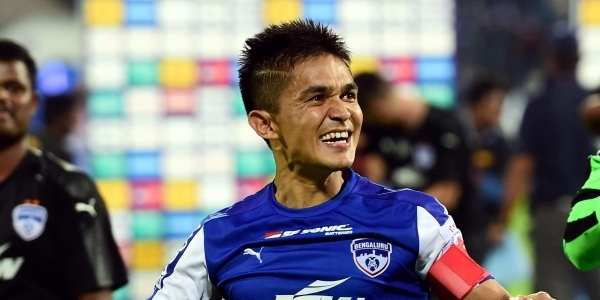 "I rate this win at probably number two, right after the AFC Cup 2016 final in Doha against the team that eventually won," goal.com quoted Chhetri as saying. "After losing the final last year we did not speak about it but everyone knew that one day we will be presented with this chance. Everybody thought about it, everybody wanted this. You know what Asia, we are back," he added. Bengaluru was not able to get over the line last season, losing the title to Chennaiyin FC. The forward felt that there are no significant changes in the squad from last year but the addition of Carles Cuadrat as manager did wonders for the team. Padma Shri 2019 Winners: Gautam Gambhir, Sunil Chhetri & Other Sports Stars Honoured by President Ram Nath Kovind; See Pics. "The characters are the same. There is not much of a difference in the style between Albert (Roca) and Carles (Cuadrat). Just slight alterations but their mentalities are the same. Also, Gerard (Zaragoza), his assistant has been a great help," Chhetri said. "It has been more progressive than what we learnt under Roca and he did not win the league and Carles did, that is the difference," he added. With this title win, Bengaluru FC now have the chance to make it to the group stages of the 2020 AFC Cup.